FILE - In this image made available by the Royal Air Force, Jan. 15, 2018, two Russian Blackjack Tupolev Tu-160 long-range bombers are followed by an RAF Typhoon aircraft (L) scrambled from RAF Lossiemouth, Scotland. Two Russian nuclear-capable strategic bombers arrived in Venezuela on Monday, a deployment that comes amid soaring Russia-U.S. tensions. Russia's Defense Ministry said a pair Tu-160 bombers landed at Maiquetia airport outside Caracas on Monday following a 10,000-kilometer (6,200-mile) flight. It didn't say if the bombers were carrying any weapons and didn't say how long they will stay in Venezuela. The ministry said the bombers were shadowed by Norwegian F-18 fighter jets during part of their flight. It added that a heavy-lift An-124 Ruslan cargo plane and an Il-62 passenger plane accompanied the bombers to Maiquetia. The Tu-160 is capable of carrying conventional or nuclear-tipped cruise missiles with a range of 5,500 kilometers (3,410 miles). Such bombers took part in Russia's campaign in Syria, where they launched conventionally-armed Kh-101 cruise missiles for the first time in combat. Code-named Blackjack by NATO, the massive warplane is capable of flying at a speed twice exceeding the speed of sound. Russia has upgraded its Tu-160 fleet with new weapons and electronics and plans to produce a modernized version of the bomber. 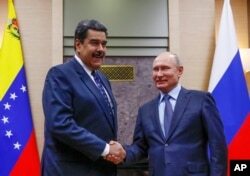 The bombers' deployment follows Venezuelan President Nicolas Maduro's visit to Moscow last week in a bid to shore up political and economic assistance even as his country has been struggling to pay billions of dollars owed to Russia. Russian President Vladimir Putin, right, shakes hands with his Venezuelan counterpart Nicolas Maduro during their meeting at the Novo-Ogaryovo residence outside in Moscow, Russia, Dec. 5, 2018. Russian Defense Minister Sergei Shoigu said at last week's meeting with his Venezuelan counterpart Vladimir Padrino Lopez that Russia would continue to send its military aircraft and warships to visit Venezuela as part of bilateral military cooperation. Russia sent its Tu-160 strategic bombers and a missile cruiser to visit Venezuela in 2008 amid tensions with the U.S. after Russia's brief war with Georgia. A pair of Tu-160s also visited Venezuela in 2013. Asked about the Russian bombers, Pentagon spokesman Col. Rob Manning said he had no specific information about the deployment. However, Manning cited the humanitarian assistance provided in Central and South American by a U.S. Navy hospital ship, the USNS Comfort, in the past eight weeks. Numerous Venezuelan migrants were among the people who received medical and dental treatment. "Contrast this with Russia, whose approach to the man-made disaster in Venezuela is to send bomber aircraft instead of humanitarian assistance," Manning said.